The brown maculations along the dorsum of the abdomen are described as being "diagnostic" of this taxon, however, may be diffuse, greatly reduced or even absent in some individuals. Males typically have more pronounced brown markings dorsally along the abdomen than do conspecific females. 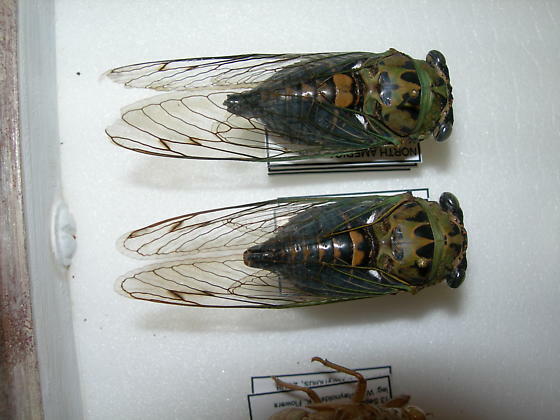 These cicadas were collected between 7:00-8:00 pm while "singing" the typical T. winnemanna/pruinosus group song. Unlike similar cicadas (other "pruinosus/winnemanna" populations) to the south and west, which may be heard off and on during the afternoon 'til sunset, our local populations in Wake Co., NC seem to be active for a relatively short time in the late evening, ceasing to call before dark. It's also interesting that some of these populations seem to pulse in choruses following a "wave pattern" from block to block as they sing across neighborhoods. Title varies: vol. 2, "American cicadas."